Communication in the nonprofit sector has in recent years become unclear, without substance or any meaning. And yet, we continue to use the NGO language, full of jargon, bureaucratic terms and general statements, since we feel obliged to use sector-specific terms which are supposed to make us a part of the “chosen” group. Indeed, if we were to look at the language used, we’d come to the conclusion that projects, activities and the general impact of the nonprofit sector has never been more important, innovative or had greater impact in the community. It seems that the important things which nonprofits deal with wouldn’t even mater if there were no complicated terms borrowed from the corporate sector which we use to talk about them. The origins of this “tainted” language can be traced to the moment an increasing number of organizations in Serbia are starting to learn about project writing, especially in terms of big international projects. Project language, as with any other profession, requires a level of professionality, seriousness and outstanding knowledge of the subject matter – something which causes a lot of stress for the applicants. As a result as well as insufficient familiarity with the subject matter combined with a desire to demonstrate expertise often lead to quite the opposite – organizations turn to a kind of communication and jargon which even those working in the sector have difficulty in understanding. An additional problem of course is created once this kind of communication is used with a wider audience (the public). The first and lasting impression for them is a state of confusion. When it comes to communicating in the nonprofit sector, organizations tend to make mistakes which can be split into 3 major groups: extensive use of jargon, bureaucratic language and general statements. 1. Does anyone here speak NGO? Capacity development, stakeholders, impact, evaluation, accelerators, ideation and clusters – just some examples of the jargon which has subconsciously entered our everyday conversation, and from there navigated over to social media and communication with the public. All along giving those who use this kind of language the much-needed confidence, opening doors to desired circles making us all a part of some undefined “community”. But what do these terms actually mean and how should we be using them? NGO language has become such an integral part of our everyday, that we started using it much more often than is necessary, and what’s worse in a completely inappropriate way. This means we could conclude that an “expert” is a person who has read more than 4 articles on a certain topic; innovation is actually a signal of its lacking and capacity development really means spending a few hours at a conference. This group also includes many English words used in other languages (for example Serbian). To be fair, there are certain words which simply cannot be appropriately translated. These should be left in their original form. This is a problem we too have faced in attempts to introduce and explain the term crowdfunding to the Serbian public. In the end, it seems there really isn’t a good enough translation. If we were really to insist on translating the term crowdfunding into Serbian, we could use one of the two solutions: group financing or financing through the community. However, it is still unclear whether our audience would really understand what we are talking about. Nonprofit jargon is not even universal across the sector and becomes even more confusing outside of it. Before using this kind of terminology, think hard about what you actually want to say. A less known word or phrase can at best be confusing, and in the worst case might completely turn your message around. Precise and concise delivery of messages is always the most powerful means of communication. Save the nonprofit jargon for coffee breaks at work and keep it out of any external communication! It’s very easy to stay within the comfort of our community and forget that most people outside of it will not understand the way you might speak. This has the potential to create one of the greatest issues when it comes to the way nonprofits communicate – a lack of understanding between you and your audience. If the way you write is causing your supporters to feel incompetent or lacking in certain expertise they will stop following your work. Communicate in a way that everyone can understand and try to create an inclusive environment which will not exclude people who care about your organization and the things you do. Instead of simple communication in a language that everyone can understand, and which ought to come naturally anyway, many people tend to use professional jargon, in an attempt to sound more serious or knowledgeable. Yet in a sector where time really is money and resources are often quite limited, this kind of approach can be very detrimental as it requires further clarification for the readers and “translating” messages into a form that’s understandable for everyone. Why not use everyday language from the start instead? If we still can’t completely eliminate it from conversation the best we can do is to learn when it is appropriate to use the professional jargon, and when it is not. Save this lingo for writing project proposals and conference discussions. When talking to your audience, stick to a simple language. 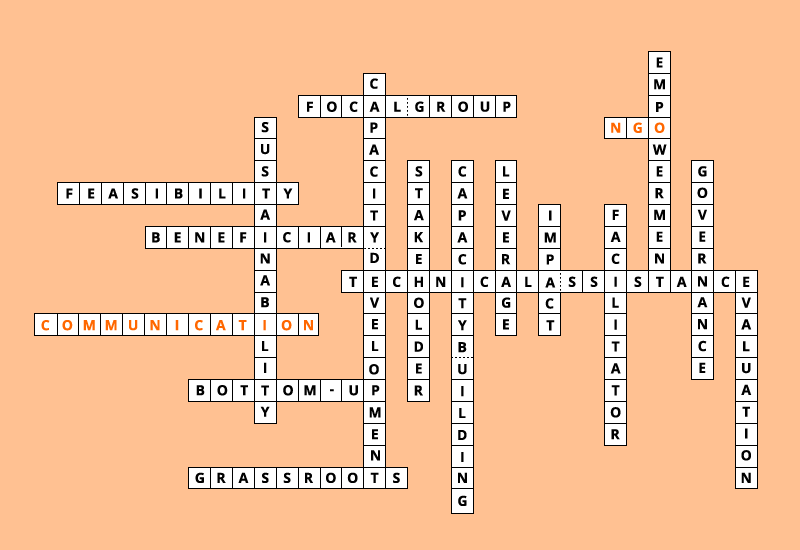 Apart from jargon, communication in the nonprofit sector is also often characterized by excessive use of bureaucratic terminology, which as it seems increases with professional advancement. Moreover, many examples from public discourse confirm the assumption that the more formal the situation, the more the speaker will tend to use more complicated terminology. Remember how often we hear talk of strategies, instead of plans, announcement of a “commencement of a period of” instead of “the start of”, people have conversations about instead of just talking about etc. Bureaucratic jargon has its place and purpose, but unfortunately neither of these is found in circumstances in which most nonprofits tend to use them. The definition itself goes: “Administrative or bureaucratic style is used for writing official requests, complaints, records, laws, reports, memos, forms, receipts. It’s characterized by writing in set patterns which leave out any room for double meaning or stylistically shaped expressions or words”. This is where the real problem with this style of communicating is evident – as nonprofit put great emphasis on creating a relationship with the target audience, through identification and personalization of messages, it’s obvious how bureaucratic jargon can only harm these attempts. From the perspective of the reader, these messages are mostly dull, uncommunicative or just plain boring, meaning that the intended message will not reach the target audience. Perhaps the most common and potentially harmful example of miscommunication in the nonprofit sector is the use of general statements. Perfected by politicians, general statements have no significance, value, content, strength and the only thing it does is to expose the insecurity and lack of preparation of those using it. Real expertise, skill, knowledge and commitment to the work is always evident in an organizations ability to transfer its message in a way that’s understandable to all. Sometimes eliminating the unnecessary can be difficult, but has a multitude of benefits. In the short term, general statements can be a good way to create an impression that we know a lot about a certain topic. But if we look just a little more closely, we quickly realize real content isn’t really there. That’s why, before sharing your story think about what you need to be explaining, and what your audience already knows. Also, bear in mind what it is that makes your organization authentic and unique. The greatest strength of your organization is a simple, honest message which everyone can understand. If you ever find yourself wondering about ways in which your organization ought to be communicating, these points are good place to start. Professional jargon, administrative language, foreign words and general statement create content which, aside from taking up space, also takes time and makes no impact whatsoever. The people who it is intended for will see it as just another example of very similar types of content, which they encounter all the time. Your message won’t be received and the time you’ve invested won’t be transformed into desired action. So, eliminate the unnecessary and confusing, remember who your talking to and what your message is. Your audience will be more than grateful.